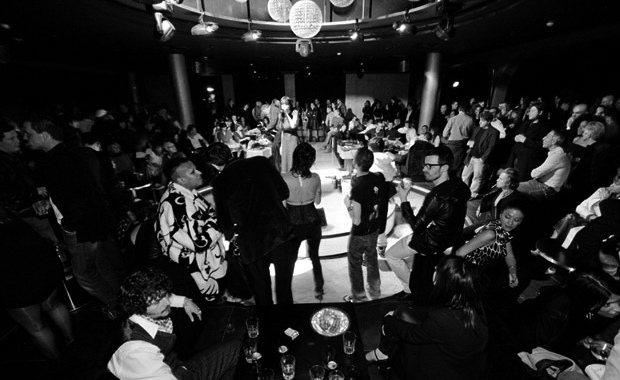 Fusion 5 Festival took place across a week in March 2008 and featured twenty artists and fifteen musicians/DJs from five continents, all converging upon the hyper-designed 3.14 Hotel located along the famous Croisette. Amongst them BORIS+NATASCHA with DEATH ON TOUR. This weekend saw a hotel in Cannes taken over by a hard-partying cabal of artists from all over the world. Organised by the Strychnin Gallery and displaying work that was largely figurative and surreal, all of the hotel’s rooms were transformed into either galleries or bizarre installations. Highlights included BORIS+NATASCHA’s Death on Tour … Dazed went along to soak up some of the extreme weirdness (not to mention a lot of the alcohol) and interview some of those involved. Thinking back, when initially invited to this Fusion 5 Festival, I really had no idea what to expect. What I got were two jet-fuelled nights of parties in the French Mediterranean, in the most progressive hotel in Cannes, surrounded by avantgarde revelers culled from thoughout the globe. Painters, photographers, digital artists, journalists, writers, editors, producers, DJs, graff artists and general libertine patrons of the arts. It was a blur, highlighted by a blistering Friday night set from A.R.E. Weapons, copious liquor, a Spanish DJ who looked like Picasso’s octogenarian horse trainer, and a closing night show by the Cobrakillers, punctuated by them pouring bottles of cabernet over their heads. All the while surrounded by works from a handpicked group of emerging artists, resulting in pure artistic revelry of the highest order. (…) Among all of this pulp, our favourite exhibitions were created by Till Krautkrämer and BORIS+NATASCHA, who satirized our obsessions with eternal youth through consumerism. BORIS+NATASCHA, a Berlin/Australian duo, created an installation about achieving immortality through shopping, and during their exhibition, viewers could purchase T-shirts to make themselves death-proof. Krautkrämer spoofed Vitamin Water with his own brand, Meatwater, available in enticing flavours like “wiener schnitzel” and “dirty hot dog”. BORIS+NATASCHA are an amazing duo who use photography, video, text: On the screen you can see Death at work. Unfortunately you have probably been photographed by Her and it’s not good for you because you may only have hours left to live. Lucky for you BORIS+NATASCHA negociated special deals with Death. On the wall, you can see some polaroids which constitute the “Superior Package” ( including a DVD of the Death at work and the story of the photographed person ). They are also made by Death and by buying one of them you can be saved ! Because the polaroid of you is destroyed and you will live as long as you were supposed to. But if you want to live longer you must play the DVD nonstop. And as a feel-good bonus, by owning the story of the dead guy who was on the polaroid, it will allow him or her to be reincarnated within a month. You can also considerate the “Russian Roulette package”, the “Hallelujah package” ( a Letter of Indulgence ), etc… BORIS+NATASCHA have well planned this Death Tour. 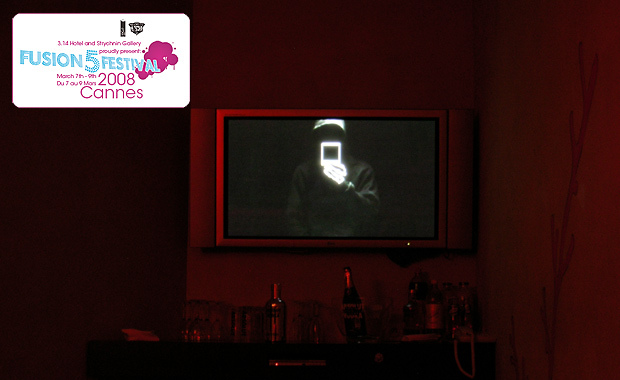 The Fusion 5 Festival, presented by Strychnin Gallery, was an art and music collaboration between 20 artists and 15 musicians from five continents that invaded the 3.14 Hotel in Cannes, France March 7th – 9th, 2008. Founded in Brooklyn in 1998, Strychnin Gallery has since spawned two sister galleries. Owner Yasha Young opened a second Strychnin in Berlin in 2002, and in October 2007, Strychnin joined Brick Lane’s vibrant art scene in London. The Fusion 5 Festival is the brainchild of Yasha Young and 3.14 Hotel owner Dani Morla. It effectively blurred the lines of genre, style and the pre-conceived notions of “scene,” creating an environment where multi-faceted underground art, no matter the sub-genre, materials or influence, existed as one. This is a notion that thrived on the contradictions. Instead of the aspiring to the “fine art” canon, conceptually, the event furthered the subversive art movement’s evolution in a direction parallel to it. Death Certificate a là the mysterious BORIS+NATASCHA – important reading if you’ve let yourself get photographed!